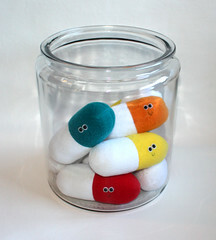 Home » Blogs » Addiction Recovery » Are We Medicating Our Feelings Away? Are We Medicating Our Feelings Away? Happiness is a feeling most of us are quick to embrace. But when feelings of sadness, anger, stress or frustration arise, it can be tempting to believe that feeling nothing would be better than feeling down. Whether it’s the laws of nature or the age-old principle of yin and yang, it seems that we are required to experience both extremes on the emotional spectrum. Human beings are social creatures that need feelings to survive. Emotions connect us to other people and help us interpret, respond to and learn from our environment. It is our emotions that compel us to be in relationships, raise families and escape from danger. When difficulties arise in our relationships, or memories of a painful childhood or troubling experience surface, it is understandable to think that numbing those feelings would bring relief. When someone is pushed to the edge of what they can tolerate, the choice may come down to suicide or emotional escape. And drugs are a quick, powerful way to disappear. But numbing painful feelings with drugs comes at a price. In addition to drowning the difficult emotions, the positive ones begin to fade. An even greater risk is addiction, which comes with its own artificially manufactured highs and lows. Over time, drug users lose touch with their emotions and, in doing so, destroy their relationships with others and themselves. The easy accessibility and perceived safety of prescription drugs have intensified the risks of addiction. Ordinary people with families and jobs are finding themselves hooked on medications. In some cases, the pills were originally prescribed for a legitimate medical purpose, such as to treat the pain of an injury or accident, and the individual became dependent over time. There is also a growing population that sets out to abuse prescription medications for their euphoric, stimulating or relaxing effects. A prevailing concept among addiction specialists is that some addicts use drugs to relieve the symptoms of an underlying condition, such as stress, depression or trauma. This is known as the self-medication hypothesis, set forth by Edward J. Khantzian and David F. Duncan. While this hypothesis doesn’t fully account for the complexities of addiction, it offers important insights into why some people become dependent on prescription medications. Self-medication is only one possible explanation for why people abuse drugs. Genetics, environment, family history, biochemical changes in the brain and other factors also increase the risk of becoming addicted. It should also be noted that drug abuse itself can cause symptoms of mental health disorders, in addition to being used in response to existing problems. It is estimated that more than half of people struggling with addiction also suffer from a co-occurring mental health disorder. As part of the self-medication hypothesis, it is believed that people who struggle with self-regulation, or who feel overwhelmed by their emotions or unable to feel emotions at all, are predisposed to addiction. Research suggests that for some, drugs become an outlet for managing relationships, low self-esteem, and feelings that are painful, threatening or confusing. Often, people aren’t even aware of their emotional state or that they are misusing medication in response to these feelings. When presented with someone who is using drugs to self-medicate, addiction specialists recognize that drugs are serving a purpose in the addict’s life. For example, someone who is addicted to painkillers like Vicodin or OxyContin may find that drugs relieve depression, reduce stress or help manage anger. A person addicted to stimulants like Ritalin or Adderall may use drugs to feel more focused or less isolated. Drug use can also be in response to a precipitating event such as a death, divorce, job loss or family crisis. In most cases, the drug of choice is not chosen at random, but based on the specific feelings the addict is trying to relieve. Once the user experiences relief from their drug use, it can be exceedingly difficult to stop. Even though the user initially found short-term relief in drug abuse, once addiction sets in they experience even more painful emotional highs and lows. Symptoms of anxiety and depression may worsen, increasing the risk of suicide, and may be complicated by withdrawal. While drugs may seem to be meeting certain needs, those needs can be fulfilled in a healthier, more adaptive way – without the negative side effects of addiction, tolerance and withdrawal – through counseling and addiction treatment. One of the fundamental components of addiction treatment is learning to experience and cope with emotions without turning to drugs or alcohol to escape. Dual diagnosis drug rehab treatment can address both the drug abuse and any underlying mental health disorders simultaneously. Rather than reacting to feelings or trying to control or mute them, psychotherapy helps addicts recognize their emotions as signals that their needs aren’t being fulfilled, which can motivate them to take action to make their lives better. Addicts in drug rehab also learn that while we need emotions to function properly, they can’t become a slave to them. With treatment, addicts realize that life is the highs and lows. Without them, they miss out on the shades and textures that make life interesting. Emotions are neither good nor bad. It’s how people respond to feelings and situations that changes the direction of their lives. Recognizing situations that prompt difficult emotions and reacting in adaptive ways – whether by taking a walk, calling a friend or processing in therapy – will always be more rewarding than numbing emotions with prescription drugs. While certain emotions may be unpleasant at times, nature has preserved one constant: hope. Even when the darkness seems endless or a string of “bad luck” is patently unfair, the laws of nature remind us that relief is right around the corner – and it doesn’t come in a bottle.